SkinCeuticals is a pioneer in the study of advanced skincare and Séchoir is proud to be a partner in these efforts to improve the quality, radiance, and beauty of our clients' skin. All of SkinCeuticals products are backed by science, dermatologist recommended, and formulated to correct signs of aging. Our mission is to improve skin health. Dedicated to this purpose, we make one simple promise—to provide advanced skincare backed by science. Born from decades of skin cancer research that led to pivotal breakthroughs in antioxidants, our high potency formulas are concentrated in pure actives and proven to penetrate optimally into skin. Made in the USA, our clinical skincare is used by dermatologists, plastic surgeons, and medi-spas for daily homecare and to compliment aesthetic procedures. We formulate to correct signs of aging, protect healthy skin, and prevent future damage. SkinCeuticals is a pioneer in the study of advanced skincare and Séchoir is proud to be a partner in these efforts to improve the quality, radiance and beauty of our clients skin. 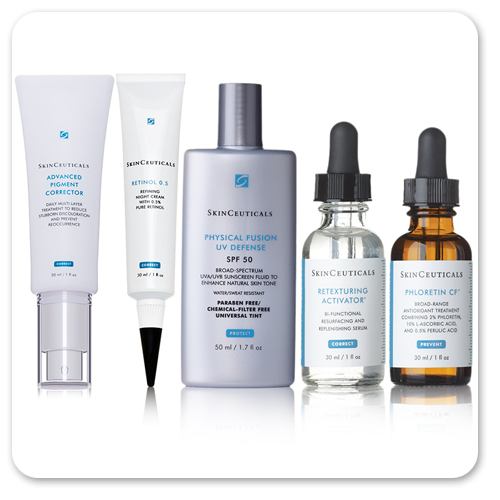 SkinCeuticals products are formulated with high concentrations of pharmaceutical grade, active ingredients clinically proven to make a significant improvement in the health and appearance of skin. The active ingredients are selected based on how they interact with each other, on skin, and within the formula itself. The ingredient combination, delivery system, and formula of a well designed product can optimize the effectiveness of its ingredients.